Canacidae, incorrectly Canaceidae, or beach flies, surf or surge flies, is a family of Diptera.There are 113 species in 12 genera. The family now includes Tethininae as a subfamily. Minute (1.6mm.-5 mm.) 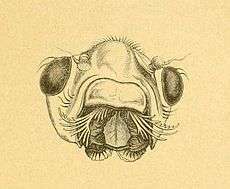 yellow, grey or grey-brown pruinose flies with whitish to greyish markings.The head is large with small antenna bearing bare to pubescent arista.The "mouth" is a large oval opening. There are three or four pairs of orbital bristles on the head directed outward (inset upswept).Postvertical bristles are absent but diverging pseudopostocellar bristles are present.Other head bristles present are ocellar bristles, 2-5 pairs of frontal bristles, curving outward, interfrontal bristles and vibrissae. The genae are high with 1 or more upcurving bristles. Tibiae are without a dorsal preapical bristle. The wing is in almost all species unmarked.The costa has a subcostal break, the subcosta is parallel to vein R1 and merging with that vein just before the costa. Tibiae without dorsal preapical bristle. 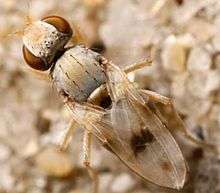 Canacidae are mostly intertidal flies.They ar found along sea coasts, on the surface of small water bodies, saline and fresh, at places protected from wind. They feed on Infusoria and other minute organisms. ↑ Mathis, Wayne N. (1992). "World Catalog of the Beach-Fly Family Canacidae (Diptera)". Smithson. Contr. Zool. (Print). Washington, D.C.: Smithsonian Institution Press. 536: 1–18. doi:10.5479/si.00810282.536. ↑ Munari, Lorenzo; Mathis, Wayne N. (2010). "World Catalog of the Family Canacidae (including Tethinidae) (Diptera), with keys to the supraspecific taxa" (PDF). Zootaxa. Auckland, New Zealand: Magnolia Press. 2471: 1–84. ISSN 1175-5334. Retrieved 25 January 2012. ↑ Mathis, Wayne N (1998). Papp, L.; Darvas, B, eds. Family Canacidae. Contributions to a Manual of palaearctic Diptera. 3. Budapest: Science Herald,. pp. 251–257. ↑ Mathis, Wayne N; Freidberg, A. (1991). "Review of Afrotropical beach flies of the tribe Canacini and subfamily Nocticanacinae (Diptera: Canacidae)". Proceedings of the Entomological Society of Washington. Washington DC, USA: Entomological Society of Washington. 93: 70–85. ISSN 0013-8797. 1 2 3 Haliday, A.H. (1837). "New British Insects Indicated in Mr. Curtis's Guide". Annals and Magazine of Natural History. 2: 183–190. doi:10.1080/00222933809512369. ↑ Mathis, W.N. ; Munari, L. (1996). "World Catalog of the Family Tethinidae (Diptera).". Smithsonian Contributions to Zoology. Smithsonian. 584: iv+1–27. doi:10.5479/si.00810282.584. ↑ Freidberg, A. (1995). "A study of Zaleinae, a taxon transitional between Canacidae and Tethinidae (Diptera), with the description of a new genus and species.". Entomologica Scandinavica. 26: 447–457. doi:10.1163/187631295x00107. Wikimedia Commons has media related to Canacidae. http://www.diptera.info/downloads/Munari_Almeida_Andrade_2009.pdf Munari, Almeida, Andrade Description of a new species of Tethina Excellent photos.